If there’s one question we hear frequently from dog parents, it’s, “Should I brush my dog’s coat on a regular basis?” The short answer is, yes. There are numerous benefits to brushing your dog’s coat on a regular basis, some of which go beyond simply maintaining their health and hygiene. Today, we will share with you the reasons why you should definitely keep up with brushing your dog’s coat. Along with regular brushing, it is also important to keep up with their overall grooming for their health and comfort. Ready to bring your furry friend in for a dog grooming in Greeley? Call us to book your dog’s visit, or stop by to use our self-service dog wash, where you’ll have access to all the best grooming supplies and a safe, comfortable space to work in. A dog’s coat, especially in breeds with long hair, can easily become matted. Not only is matted hair unsightly, but it also becomes a magnet for all kinds of debris, such as dirt and pests. Matting, especially when severe, can pose a health risk for your precious pup and the worse the mat, the harder it is to brush it out, which can cause your dog discomfort. Brushing your dog regularly can reduce the snarls and mats while removing dead hair and skin, distributing natural oils, therefore, keeping their coat healthy and clean. Dogs naturally shed and there’s not much us pet parents can do to stop that. But if you constantly battle clumps of pet hair in your home, or always have loose hair that clings to your clothing, brushing them can help minimize the amount of hair in your home. Regular brushing removes loose hair, especially during their shedding seasons. Dogs typically shed their winter coats in the spring and they shed their summer coats in the fall. Taking the time to thoroughly brush your dog at least once or twice a week gives you the chance to check their skin for abnormalities and irritations. As you brush them, keep an eye out for patches of missing hair, dandruff, sores, unusual bumps, newly formed lumps under the skin, and anything else that sets off warning flags. If you notice anything unusual, talk to your vet or dog groomers right away. Making time to brush your dog gives you and your furry companion a few extra minutes in the day to bond. While many dogs do not like being brushed at first, many get used to it over time and often enjoy it. If your dog is resistant to a good brushing, reward them with training treats, praise, and snuggles to turn the event into something positive. Brushing your pup can be quite calming and soothing for not only your pup, but for you also. 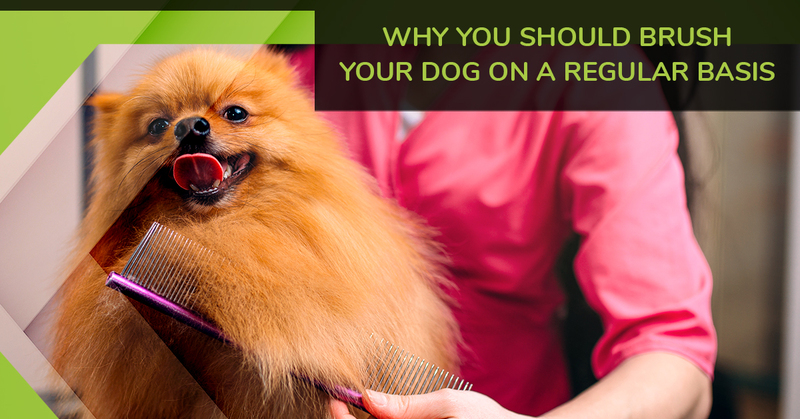 Along with brushing your dog regularly, it’s important to have them groomed on a regular basis. A dog grooming typically includes a good bath, a coat conditioning, ear and teeth cleaning, and a nail trim. Some dogs require additional grooming techniques, depending on their breed and length of hair. If you prefer to groom your dog yourself, The Dog Pawlour in Greeley offers safe, comfortable, ergonomic self service dog wash stations. Our friendly, highly skilled dog groomers would love to get your precious pup clean, soft, and shiny, so give us a call to book an appointment with one of our groomers. At The Dog Pawlour, we offer two convenient locations in Greeley and Fort Collins for all your dog grooming needs. Experience the DP Difference today!